I’m not sure I can remember a time when the world has been so politically divided. It’s a subject I want to avoid here… especially given recent events, but what does give me hope for us all is when people remain peaceful when all around chaos ensues. There are the many world renowned peace icons like Buddha, Martin Luther King, Mahatma Gandhi and Nelson Mandela; people who’ve gone on to inspire millions with their teachings, words and peaceful actions. But in this world of social media, I am most moved by the simple actions of one person that inspires waves of followers. They are the ones that create iconic pictures that resonate for generations. The Tiananmen Square Tank Man, even though to this day neither the identity nor fate of the man has been discovered, his actions left us with an astonishing image of peaceful protest that has burned itself onto our brains. 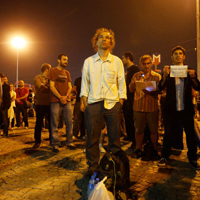 More recently Erdem Gündüz – who became known as the ‘Standing Man’ in the protest movement against the crackdown on demonstrations in Gezi Park, Turkey. His silence was so powerful that reputedly the police had no idea how to deal with him until hundreds gathered to join him. Peace and calm can be a powerful tool. From Winston Groom’s Forrest Gump, Peter Sellers’ Chauncey Gardiner, to Harold Fry’s Unlikely Pilgrimage… our storytellers have depicted the power of peace without an ‘agenda’ for generations and we’ve all been charmed by them. It’s much simpler to spit hateful words and throw our weight around when we disagree with someone/thing, but my respect will always lie with the one who holds back from that knee-jerk instinct we all feel, and considers a peaceful and empathetic way to act when under duress. That, for me, is true power and true grace. 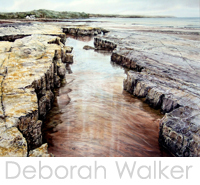 Once again this month there’s some exciting news everywhere, but let me first introduce you to the astonishing brushwork of our newest recruit, Deborah Walker RI. An incredibly accomplished watercolourist (can you believe these are watercolours?!!) 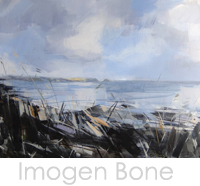 she was elected a member of the Royal Institute of Painters in Watercolour in 2011 and went on to be elected to their council in 2014… say no more! Please take a moment to view the beautiful pieces we have already on the website. She currently painting some more local scenes for us but I just couldn’t resist getting in some of her available work in the mean time which you can see here… they’re just soooo beautiful! 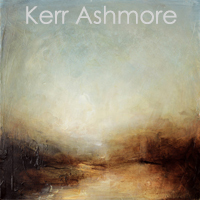 The incredible Kerr Ashmore has been painting for us and there’re 3 newbies on her page of our website right now with some big pieces on the horizon. Sooo breathtaking! 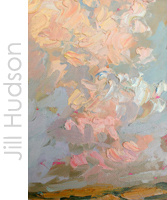 Jill Hudson is on her way with four superb new pieces tomorrow, a diversion to her usual style, this colourful impasto is just ginger-peachy! 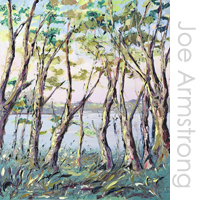 And talking of colourful, that smashing Joe Armstrong did well in his Fisherman’s Shelter exhibition last week. We still have some on the website, though, and, boy, are they beautiful! Hilary Stock came in with some incredible new work, too. A diversion from her 9-block boxes, these are slimline, floating art-card photos and are much larger than her box-work, so very impactful. 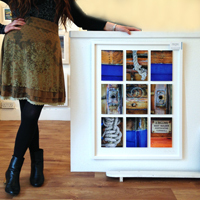 Here’s a pic of them modelled by our lovely Deborah to give a feeling of their size. Cool, eh? 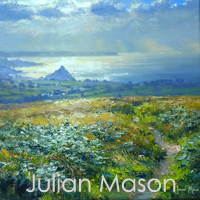 And for all you Julian Mason fans out there, we’ve literally just taken stock of three brand new pieces. We have another nine on their way to us, but for now, get in there quick if you like this fella’s work. They’ll fly out the door, you mark my words! And talking of flying out the door, our most popular painter, Ben Taffinder, has been bringing more and more in to cover his incredible sales. 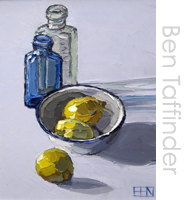 This bottles with Lemons, for example, I suspect won’t last the day – few of his still lifes do – but there’re alway more from that fella, so keep your eyes peeled on his page. So there it is for another month. Imogen Bone has sold out of her biggies so we’ll be getting more large ones from her very soon and I’m gonna hit you with an incredible new artist next month, too. But to beat the queues, keep an eye out on our Facebook, Twitter and Instagram feeds or the website for a first bite of the cherry. They always reach those platforms first! 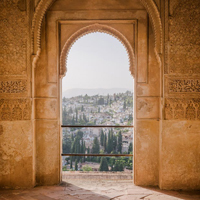 As many regular readers will know, I’m a great believer in If a door opens, we should walk through it. It’s so ingrained in the way I live life and run my businesses that when it’s challenged by ‘head’ stuff as much as it is at the moment, my faith in ‘the process’ can’t help but become clouded.